Since 2007, TV Club has dissected television episode by episode. Beginning this September, The A.V. Club will also step back to take a wider view in this, our new TV Reviews section. With pre-air reviews of new shows, returning favorites, and noteworthy finales, the TV Reviews section doesn't replace TV Club—as usual, some shows will get the weekly treatment—but it adds a look at a bigger picture. It’s a privilege to see Shakespeare performed by an actor in the prime of their faculties, with a heavyweight role that tests the limits of their range and the nuance of their expression. There are performances of certain roles that become iconic, masterpieces in their own right: Judi Dench as Lady Macbeth, say, or Derek Jacobi in Hamlet. The Hollow Crown—aptly brought Stateside by PBS’ Great Performances series—offers three titanic lead performances in the plays of the Henriad, the epic trilogy that tells the story of the opening salvos of the Wars Of The Roses. Especially for American audiences, Shakespeare’s histories are more opaque than his comedies or tragedies. They lack the obvious appeal of the comedies and their happy endings, or the quotability of the tragedies. But especially for audiences accustomed to watching award-winning television, the histories feel like the prestige series of Shakespeare’s time—more serious than sitcoms and more relevant than the average dramas, gripping because there’s so much truth within the fiction. The Hollow Crown is a masterful adaptation of the Henriad, succeeding in spite of dense prose and staggering length. (Henry IV is split into two parts; onscreen, it clocks in at four-and-a-half hours of solid Shakespeare). Richard II is left mostly intact, save some editing down, while Henry IV and V are rearranged so that some scenes can happen before others, or even simultaneously. Shakespeare has never been brought to television so well. The serial nature of The Hollow Crown means that actors can play the same roles throughout. Simon Russell Beale and Tom Hiddleston are present from the opening scene of Henry IV, Part I to the end of Henry V, a good seven hours later. The producers—Sam Mendes, along with Pippa Harris and Downton Abbey’s Gareth Neame—worked on all three productions as well, so the trilogy has a coherence that lets the shared themes between them reflect off of each other and resonate with the audience. At the same time, each installment has a different director, meaning that the visual language changes from part to part. The inconsistency could be jarring, but if anything, it matches how the plays themselves differ in style and era. Of the three, Richard II might be the most memorable, though it also the most markedly different. Henry IV and Henry V have a huge overlap of character and story; Richard II is set far enough beforehand that even though Henry Bolingbroke is present throughout as King Henry IV, he’s played by two actors. The Hollow Crown’s Richard II has its flaws—of the series’ four parts, Richard II feels most like a low-budget film adaptation, with its choppy camerawork and suspiciously bare sets—but the acting is incredible. Ben Whishaw transforms entirely into a fey, vain monarch, conceited but sensitive, proud but weak. Rory Kinnear, playing across him as the righteous usurper, presents a complex notion of the man who will become king solely through long looks and eloquent eyes. Henry Bolingbroke doesn’t have to be sympathetic. Neither does Richard II. But in Whishaw and Kinnear’s performances, the two kings bring out the humanity in each other. The other breakout of The Hollow Crown is Tom Hiddleston, who, like Whishaw, takes his role by storm. He’s given a trickier character to play—less nuanced, and yet truly confounding. 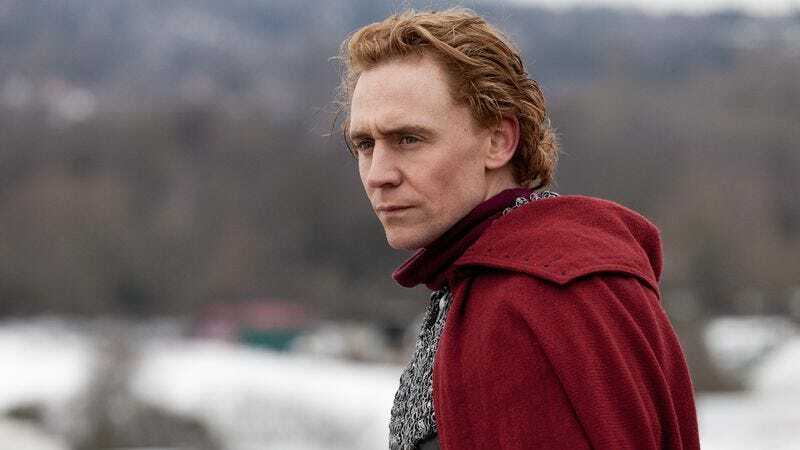 In Prince Hal, Shakespeare presents a story of total transformation, told so obliquely as to be almost invisible. Hiddleston doesn’t leap of the screen in the role, but that’s precisely because he’s not supposed to. Instead, the actor presents the true grandeur of his character—his baffling commoner’s spirit, combined with his regal majesty. Massive casts—which also count Jeremy Irons, Michelle Dockery, Patrick Stewart, and John Hurt among their numbers—and endless dialogue could weigh down The Hollow Crown, but the atmosphere of the era comes through strongly. It’s best done in Henry IV, in which cinematography and setpieces are allowed to breathe. It takes more time, but it’s also bewitchingly immersive, and the more modern editing of these installments means that scenes flow into each other far more naturally. (Director Richard Eyre takes a writing credit on the two episodes of Henry IV—next to the bard himself.) This updating of the material is necessary because while profound, Henry IV is also a long, meandering play. It’s to Eyre’s credit that the climax snaps with tension, as Hiddleston finally faces off with his rival, played by bright-eyed Joe Armstrong). The director of Henry V, Thea Sharrock, follows up Henry IV’s nighttime soap-opera tangents with an epic war film, giving its lead the action-hero treatment that Shakespeare clearly meant for him. It even ends with him getting the girl, but Sharrock ducks that pat conclusion with her own spin on the Chorus’ frame narrative of Henry V. The nameless Boy from the battle of Agincourt grows up to be the nameless Chorus, and in the final scene of The Hollow Crown, he’s seen at Henry V’s funeral, as the court is in mourning. It’s an extra-textual interpretation, but a good one, for as a good Chorus is supposed to, it brings the focus back to the audience. This isn’t just a story, it’s a history, and admirably, the work of the players has brought it to life. Reviews of The Hollow Crown by Kevin McFarland will appear weekly.